Gordon Brown has announced £30m (38m euros; $60m) of additional financial support for the Palestinian Authority (PA), on a visit to the West bank. The prime minister also promised further support in training the Palestinian police, after talks with PA President Mahmoud Abbas. Mr Brown met Mr Abbas in Bethlehem after talks in Tel Aviv with Israeli President Shimon Peres. The trip follows an earlier visit by Mr Brown to Iraq. The money pledged by the prime minister is part of ongoing financial backing for economic and social development in the territories. Mr Brown said the assistance would help the "great entrepreneurial flair" of the Palestinian people come alive. "The prospect, in my view, of economic prosperity in the future is another impetus for the peace talks to be successful," he said. Mr Brown also said he will host an investment conference in London. The prime minister said the West Bank barrier erected by Israel was "graphic evidence of the urgent need for justice for the Palestinian people" and an end to the occupation of Palestinian land. However, he emphasised that progress will largely depend on establishing an end to violence and a resolution to disagreements over Israeli settlements in the West Bank. He said that, as a child, he had learned about Bethlehem from the Bible as "a symbol of peace and a symbol of hope". "Today, the wall here is graphic evidence of the urgent need for justice for the Palestinian people and an end to the occupation and the need for a viable Palestinian state," he said. Mr Brown called on all parties to "seize the opportunity" to create "a Palestinian state that is viable alongside an Israel which is secure". The prime minister's schedule also includes an address to the Israeli parliament, the Knesset, on Monday - the first by a British head of government. 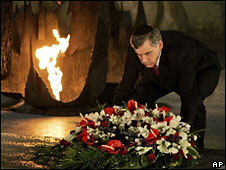 Mr Brown began his visit by laying a wreath at Jerusalem's Holocaust museum. Afterwards he said: "Nothing prepares you for what we see here. "This is the story of the atrocities that should have been prevented, the killings that should never have happened, the truth that everybody who loves humanity should know." He said he was committed to enabling pupils from every school to go on trips to Auschwitz to learn about what happened there. Mr Peres said it was "a real pleasure" to welcome Mr Brown, calling him "one of the most respected leaders of our time". 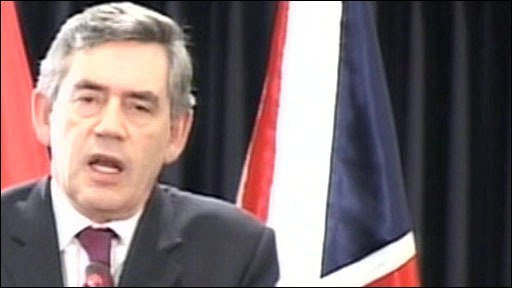 He also praised the British prime minister for his religious beliefs, voicing admiration that Mr Brown had been an economist for so long and also remained a "sincere believer". During his trip, Mr Brown will stay at the King David Hotel - the British headquarters in colonial times. The visit to Israel is Mr Brown's first since taking over as prime minister a year ago. He visited Iraq on Friday for talks with Prime Minister Nouri Maliki before moving on to see British troops stationed in the south of the country. The visit was made ahead of a statement next week on Britain's involvement there. Mr Brown said that although "huge progress" had been made he would not set an "artificial timetable" for reducing troop numbers. Plans to halve UK troop numbers to 2,500 by spring were delayed due to violence in Basra at the end of March. Numbers had been reduced from 5,000 to 4,000 between October 2007 and early April. Mr Brown praised the professionalism and courage of British troops at Basra Air Station and told them their work would make a huge difference to the country in the long term.